Please Pick Up After Your Pet Thank You! 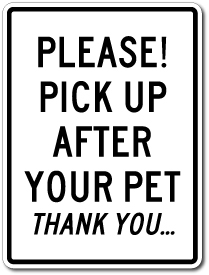 Home > Pet Signs > 12 inch x 9 inch Pet Signs > 12" x 9" Please Pick Up After Your Pet Thank You! 12" x 9" Please Pick Up After Your Pet Thank You! Provide friendly reminder and direct viewer with the information you wish to convey such as No Pooping Signs, No Dogs Allowed Signs, Designated Pet Area Signs, Dog Park Signs, No Dog Signs and more. 12" x 9" Aluminum Sign with Standard 1/4" Mounting Holes Centered Top and Bottom. These signs are available in your choice of RED, BLUE, BLACK or GREEN on white background. Each has a reflective sign face option achieved by applying 3M HIP reflective material. At Sign Mart, we strive to bring you the very best in sign products. If you have questions or need assistance of any kind please don't hesitate to contact our customer service department and a member of our friendly staff will be happy to help you. Copyright SignMart.com. All Rights Reserved. eCommerce Software by 3dcart.